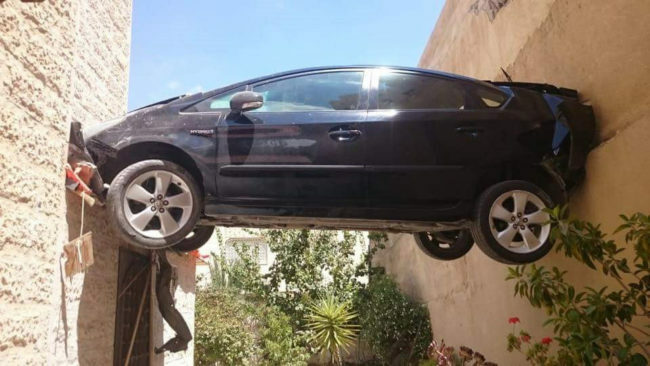 Saw this photo of a car accident the other day in Amman, Jordan. My brain hurts from trying to understand how it happened. We know our God does the impossible, was this driver trying to pull a god thing on us? Totally weird. Perhaps this person needs to be thanking God that they were able to walk away from this accident. How many times have you had something weird happen to you? Every so often I see something that I can not explain. There is nothing that God can not change for your good. He has kept many from death. When you find yourself in a situation that is coming right for your face, just say the name of Jesus because that is all the time it takes for your miracle to happen. Thank you Jesus for the many times you have intervened in our lives!